Jonathan India was slumping in a big way entering Tuesday night’s game for the Daytona Tortugas. The 1st round pick from 2018 was 2-20 with 3 walks and 8 strikeouts through the teams first 5 games. That was good for an OPS of .317. Small sample size alert, but the start to the season began with a slump for India. On Tuesday night he busted right on out of it. After striking out in the 1st inning on a full count, Jonathan India came back to the plate in the 3rd inning and flew out to center field. That put him at just 2-22 on the season. That’s an .091 average for those keeping track at home. In the 5th inning he led off with a single up the middle. The next time he came to the plate he clobbered a home run, his first of the season, to center field. It was 103 MPH off of the bat. In his final trip to the plate, in the 8th inning, he would line a single to left field to plate Miles Gordon – capping off a 3-5 night. Josh VanMeter homers again. Then again. Begin again. On Monday night in Columbus Josh VanMeter hit a long home run off of the top of the scoreboard. Last night he decided that one home run in Columbus wasn’t going to be enough. The Louisville Bats second baseman smacked 2 home runs and drove in 4 runs to help lead the Bats to a win. He’s hitting .381/.409/.905 with 2 doubles and 3 homers through 6 games with Louisville this season. 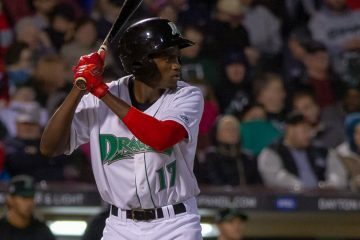 The Dayton Dragons had misfortune on Tuesday night. After leading 2-0 heading into the bottom of the 8th inning, but a grand slam with 2 outs by Fort Wayne put the TinCaps ahead of the Dragons heading into the final inning. Bren Spillane did what he could to keep the game going, though. He took a 2-1 offering with a runner on and hit it 108 MPH on a line drive into the seats to tie the game up. It was loud. And it got out of the stadium with a quickness. The strikeouts have been there for Bren Spillane this season, but when he’s made contact he’s made it count. He’s hitting .333/.417/.524 for the Dragons through the first week of the season. 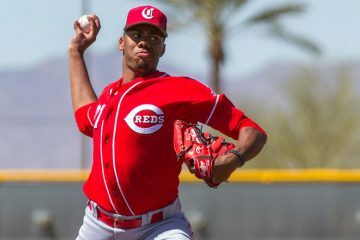 The Cincinnati Reds announced on Tuesday night that Hunter Greene’s Tommy John surgery was successful. It was performed in California by Dr. Neale ElAttrache. He’s the same surgeon who performed the surgery on Shohei Ohtani and Johnny Cueto – among many others. With the season underway there are a few players who were missing from rosters that caught the attention of myself, and of some of you. As I try to do, I checked in on them to get some updates. Left-handed pitcher Wennington Romero, who made 24 starts for Daytona last season, hasn’t pitched yet this season in games. He is throwing, though, and the expectation is that he’ll be ready for game action soon. Michael Beltre split his 2018 season between Dayton and Daytona. 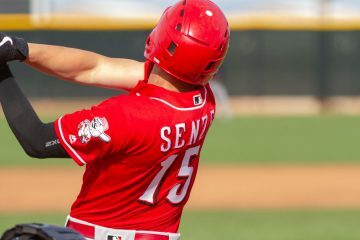 The Reds 24th rated prospect hasn’t played yet this season, either. He’s expected to play soon, too. Catcher Chad Tromp injured his shoulder at the very end of the 2018 season. He’s still rehabbing that injury. He’s not expected to be on the field again until later this summer, but I’m told he’s making great progress. 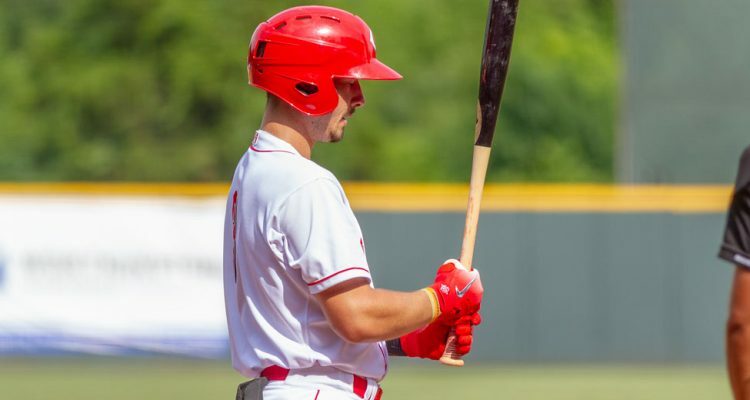 Sebastian Elizalde, who spent the early part of 2018 with Louisville before heading to his home country of Mexico to finish out the season (still under contract with the Reds, but “on loan”), was a free agent after the season but re-signed with the Reds. He’s dealing with a finger/hand issue. The timetable on his return isn’t quite certain – though it’s not considered serious. I heard a lot of positive buzz about India from a few different places in spring training. It’s always tough to start out the year in a slump, but you have to trust that these guys are going to hit. See ya in June/July 2020 Hunter. Do you think this drops him off of most top 100 lists until he re-establishes himself? I would think so. No greene won’t completely drop out. Prob not even top 50 and those who had him closer to 50 prob did so due to them assuming TJ was coming. Rankings are projections and few still project better than Greene. I’m sure one could argue that Greene never established himself in the first place. A 12.5 ERA in a handful of starts in 2017, and a 4.5 ERA in half a season last year hardly establishes much of anything. His lofty prospect rating is based on high-ceiling upside more than anything he has done as far as production goes. As long as he stays off the field, he can’t damage that hype, which he tends to do when he actually pitches. The Reds need to keep in out of any bars and any fights in the next year so he doesn’t become the next Brien Taylor. (Off topic) https://www.mlb.com/news/billy-hamilton-scores-from-second-on-sac-fly?partnerId=ed-13621205-1135949843 former Red BH scores from second of sac fly. Ironically he carries a higher batting average than any red not named Tucker Barnhart too. Its also right in line with his career average, which is why hes no longer with the Reds. Regardless of BA (etc) I think it is neat to see an MLB player score from 2B on Sac Fly. It doesn’t happen often. Can anyone remember a report after a Tommy John or any other joint surgery where the report wasn’t “successful “. Ever hear one where Doctor said the surgery was awful, we could not fix it, the player should quit now? I actually tweeted that out last night. Had two people chime in – JJ Cooper said even if it didn’t go as planned you never hear about it the day it happened. Will Carroll says he remembers one where a guy had a reaction to the anesthesia and they had to abort the surgery and go back and do it a week later. It’s an interesting question. With zero medical background, I wonder if the issue isn’t the surgery but the recovery, rehab, setbacks, desire to continue, and so forth. It will be interesting to follow Ohtani’s recovery – perhaps non-pitching game action will keep his game instincts intact and ease the transition back to pitching. I’d expect most pitchers (w/o field experience) to struggle more with catching back up to the speed of the game than the purely elbow soundness questions. Given the success rate of TJ being about 90%, it’s probably not the surgery – but every so often of that 10% unsuccessful recovery there’s probably some bad surgeries in there. I mean, the surgery itself can be successful. Whether the rehab process works or not is a different story. Successful surgery is getting the old one out and the new one attached properly. It’s a BS line they tell people because you always get asked when you finish. 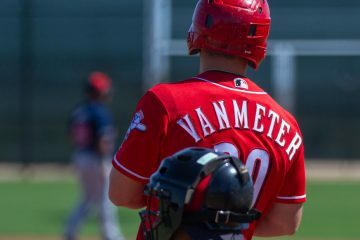 Will van meter get the call up this year?